After graduating from the University of Michigan-Dearborn, Sean Murphy started Tuebor (previously called Tuebor Tourism) in 2013 to provide shirts and products that both residents and visitors to Michigan and Detroit will enjoy. The company now offers a handful of gift items from the city, most of which are made in Detroit. Tuebor collaborates with local designers, artists, and craftsmen to create unique made-in-Michigan products. The word "Tuebor" is Latin for "I will defend" and is one of the three mottos on the Michigan state flag. I had the opportunity to ask Murphy some questions about his company and his feelings about Michigan and Detroit. I grew up Downriver in Taylor. I have been fortunate to experience different areas of Southeastern Michigan growing up. I have lived in Taylor all my life, but I went to high school in Wyandotte and college in Dearborn and have worked in the city of Detroit since I was 16. 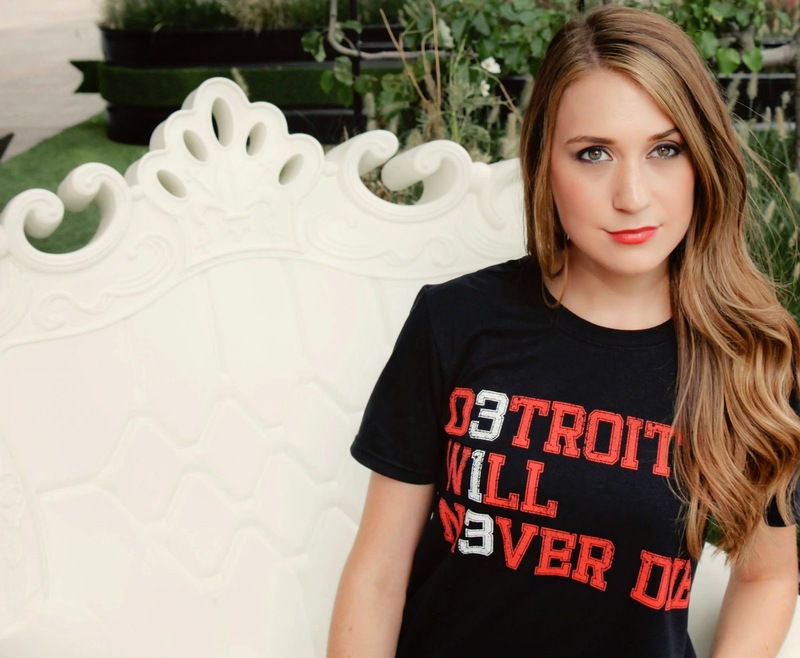 I decided to form the company because I believe that there is a need for a business that focuses on offering Detroit/Michigan apparel that appeals to not only Michiganders but also to visitors. I created the company after working for over five years in downtown Detroit at a sports store that features a tourist section. This section of our store, at one time, was the only place you could pick up a souvenir from the city, so if you liked the style of the shirt or gift, that was great, but if you did not, you really had no other options. Things have picked up in this section of our store since I started there, but the lack of stylish souvenirs that represent both the city of Detroit and state of Michigan are hard to come by. I hope that Tuebor will one day be the go-to store to pick up awesome Michigan-made products to bring back home. What do you have to offer that other Michigan/Detroit T-Shirt companies do not? I believe that anyone who is trying to help shine a positive light on the city of Detroit or the state of Michigan is doing a great thing and should be recognized for it. The cool thing about Detroit specifically is that everyone there has a unique craft that they are using to help contribute positive things back to the city. Detroit used to be a melting pot of people from various nationalities. This is still true, but now our melting pot is full of people from various job fields as well. Tuebor is different from other companies because we try not to focus on inside jokes that only people from Michigan would understand. The biggest thing that allows us to set ourselves apart from other companies is where we print our shirts. We believe that if we are using Detroit's name on our products, then it is important that we maintain our connection to our city in some way. We are proud to say that our shirts are printed in Detroit, our wood products are made in Detroit, and our other handmade goods are mostly crafted in Michigan. There are companies out there, not to throw any under the bus, that like to claim they are a Detroit company, but the city of Detroit does not play a role anywhere in their product creation process. We would like to believe we are a fresh choice for people to express their love for the state. In addition to T-shirts, your website has mugs, pop art, photography, and wood coasters. Do you have any plans to expand into new products? We are always thinking of new products to add to the site. I think the thing to remember is that not everyone is looking for a T-shirt just like not everyone is looking for a framed picture, so offering a little bit of everything is something we want to continue doing. We try hard to find new artists to work with to create new made-in-Michigan/Detroit products, allowing us to continually add new products to our site. Any artists or friends of artists out there reading this should feel free to e-mail us! What are your favorite things to do in Detroit or Metro Detroit? I really enjoy biking around Detroit. People claim how beautiful the city of Detroit is, and it is even better when experiencing it while riding a bike. From Belle Isle to Midtown to Corktown, witnessing the city from something other than a car is a great, new perspective! Are there any places outside of Michigan that you love to visit? Any places you enjoy visiting in Michigan or where you hope to go soon? Outside of Michigan I would have to say New York and Sydney are my two favorite places. I think I took the idea of the company from these two cities. You cannot walk a city block without seeing a store that features products for visitors. Offering this idea for the city of Detroit in the busy districts could be beneficial. As far as places in Michigan, I think the U.P. doesn't always get enough attention from people down in Southeastern Michigan, so I would like to explore that part of Michigan more. I started working downtown when I was 16 and I am now 24. The changes I have witnessed since then have been almost unbelievable. It was a struggle to even find a place to eat outside of Greektown, and if you did walk to find food, the city was virtually deserted. As the years went on, more and more businesses wanted to take their gamble on the city and the people followed. I think looking at Campus Martius is a great way of seeing noticeable change. If it was not Christmas time there was next to no one at the park because no one felt that they had a reason to be there. If you were to go down there today it would be tough to find a seat to sit on in the park, and even getting there you would be walking shoulder to shoulder with workers, visitors, and citizens. Companies like Starbucks, Potbelly, and a slew of food trucks now surround the park. I believe Detroit is the model of how to make something out of nothing, and Campus Martius Park is the focal point of it all. Who makes the wood coasters with the outline of the state that you sell on your site? The wood products are created by a local artist out of the city. He has done great work for us and there are even more products coming for the line, much like the coasters. Where can people who are interested in purchasing your items find them besides your website? People can find products both at our web store and at Sports Mania in Greektown. To purchase Tuebor products, visit their website at Tueborclothing.com. FOR FREE SHIPPING, enter the code Michigander at checkout.